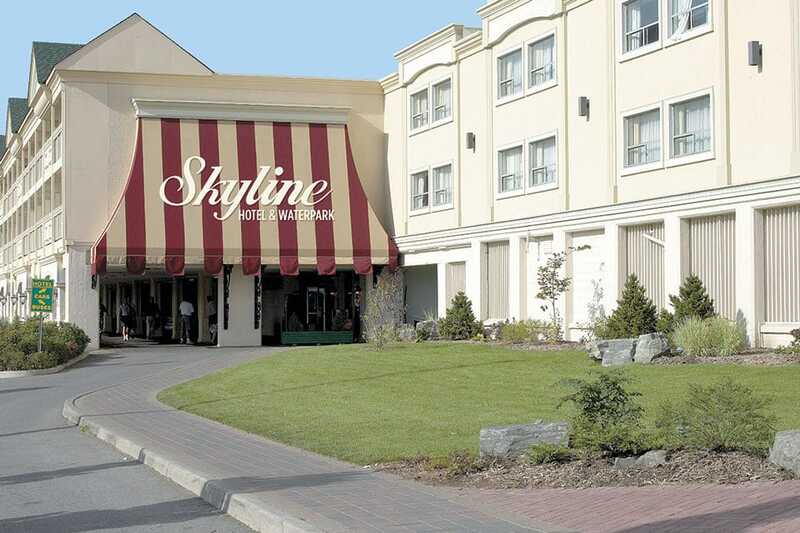 The Skyline Hotel & Waterpark is one of Niagara’s most popular family hotels. 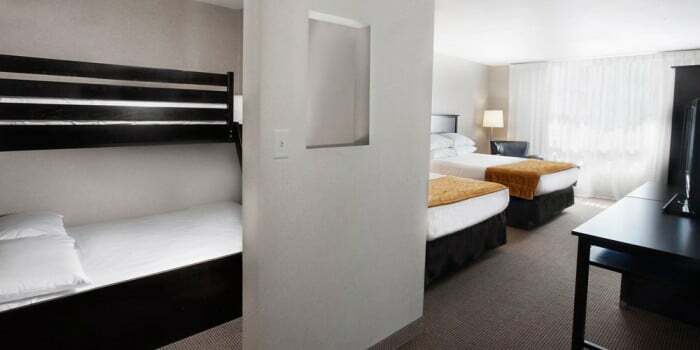 Skyline is a CAA/AAA 3-Diamond rated hotel that offers spacious and comfortable oversized family guestrooms and bunk bed rooms that can accommodate up to six guests. Each of the 206 guestrooms feature a mini-fridge and upgraded bathroom. 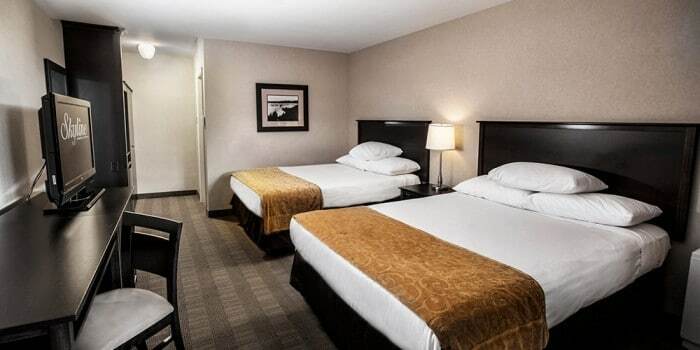 The Skyline Hotel & Waterpark also offers an on-site Perkins Family Restaurant, free wireless Internet in the lobby and courtyards, and an indoor skywalk to the Fallsview Indoor Waterpark. Each night, the hotel welcomes you to bring snacks, blankets, and pillows to one of three indoor courtyards for a free viewing of a family friendly movie. Visit Fallsview Indoor Waterpark this spring and enjoy $300 in free attractions dining and entertainment. Stay at one of four amazing hotels at Niagara's premier family destination! 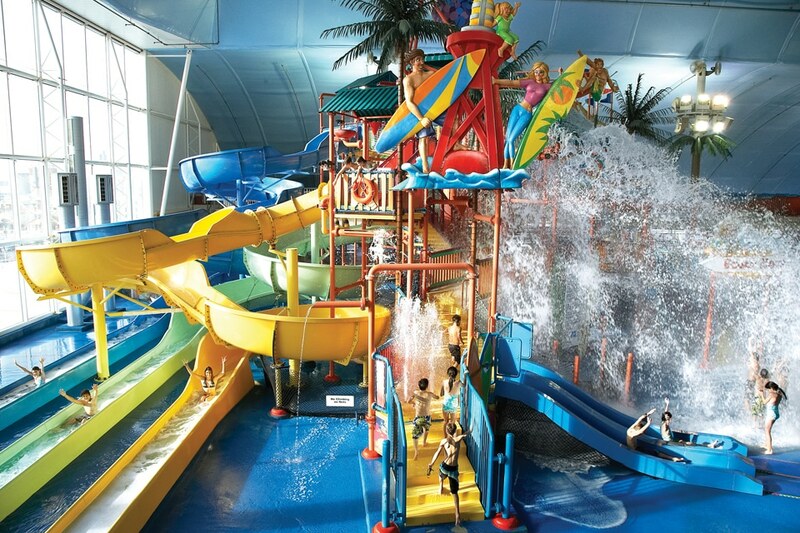 The Fallsview Indoor Waterpark offers 3 acres of fun for your entire family. Our Waterpark Getaway Packages feature 4 waterpark passes that give you access to the park for two days, and exclusive early access to the park on select dates. Experience the 16 waterslides, Tiny Tots Splash park, Beach House Mammoth Aqua Play Area, giant wavepool, outdoor sundeck, activity pool & more. You will also enjoy direct indoor connections to the Sheraton on the Falls, Crowne Plaza Fallsview, and Skyline Hotel & Waterpark. This experience connects you to the 24-hour excitement of Casino Niagara or Fallsview Casino Resort and allows you to experience the best in spa treatments, fallsview dining, and Niagara wine. Bunk Bed Family Suites feature two queen size beds, and a bunk bed with a double and single bunk in a separate sleeping area. This guestroom also features two televisions, one in the main room, and a 19” Flat Screen TV in the bunk bed area. Designed for a large family travelling together, these suites can accommodate up to six guests. The Family Suite is a spacious room that offers three queen size beds that can accommodate up to six guests and has an in-room refrigerator. This suite upon request adjoin to another guestroom to optimize on space while allowing parents to keep their children close. Family Suites are located in the corner of the courtyards providing easy access to the courtyard especially on movie night when families are encouraged to gather in the courtyard to watch a family movie on the big screen. 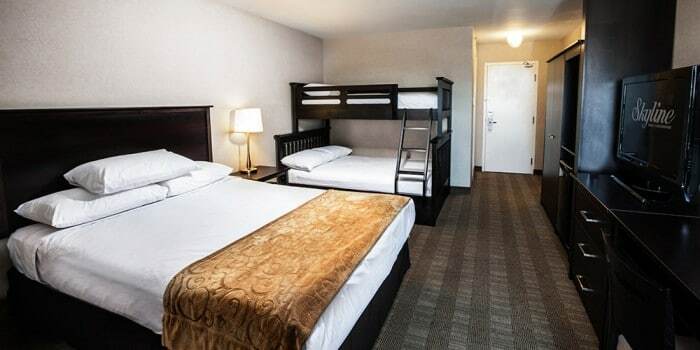 For a location and a room that keeps you close to all of the action while providing the optimal homebase for a family on the go, the Skyline Hotel & Waterpark Junior Bunk Bed Studio rooms are the perfect choice. This room looks out onto the Fallsview Indoor Waterpark and Casino Niagara and provides accommodations for up to 5 guests. These spacious newly updated traditional guestrooms feature two queen size beds, upgraded bathroom with hairdryer, and rounded shower rod designed to provide more light. Additional improvements include: in room coffee makers, iron/ironing boards, new carpeting, artwork, Internet dataports, and in-room pay per view movies. A unique feature of the Skyline Hotel & Waterpark are the enclosed climate controlled courtyards that are filled with lush plants and trees, this traditional courtyard guest room offers two queen size beds and easy access to the courtyard. 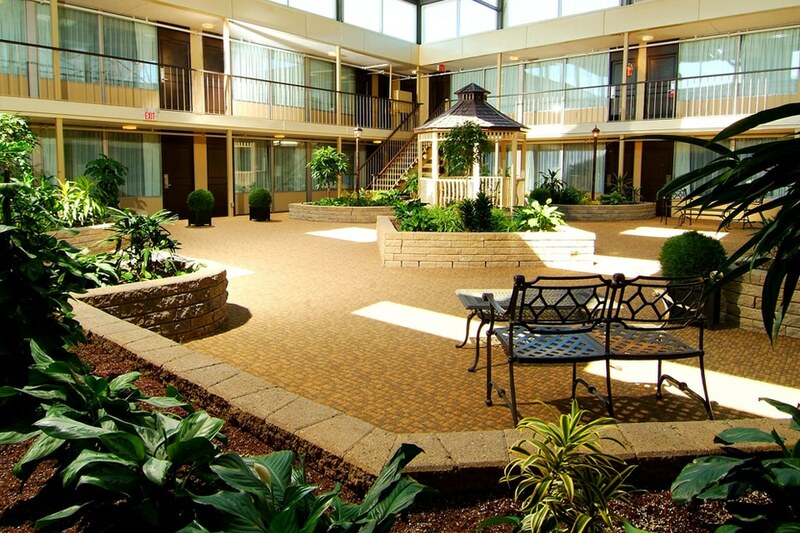 The courtyard is the ideal space to relax and enjoy the natural light any time of year. These rooms may adjoin the Family Room on request providing extra space and easy access for families.